Another area which perhaps needs some additional explanation is the concept of antimatter, and why our universe consists almost entirely of matter and hardly any antimatter. According to theory, the Big Bang should have produced matter and antimatter in equal quantities. Thus, for every quark produced in the early stages of the Big Bang, there would also have been an antiquark; for every electron, a positron (the antiparticle of the electron); etc. The apparent asymmetry of matter and antimatter in the visible universe is one of the greatest unsolved problems in physics. The British physicist Paul Dirac first predicted the existence of antimatter in 1928. For each of his theoretical equations, there appeared to exist another associated solution, with all the properties reversed, which did not seem to physically exist in the known universe. This antimatter, then, is the “mirror image” of matter, and the antiparticles of which it is composed are the mirror images of normal particles, being the same size but having opposite electrical charge. Dirac’s equations also predicted that, if enough energy could be concentrated, an antielectron (always accompanied by an electron in order to preserve the overall electrical charge) could in theory be produced where none had existed before! 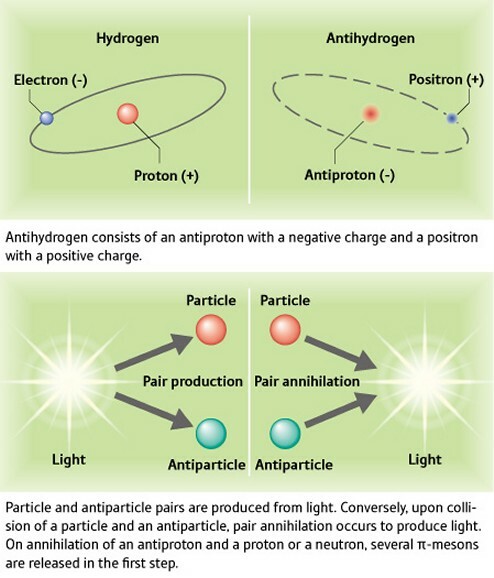 In 1933, Carl Anderson successfully demonstrated the appearance of this hypothetical antielectron (which he called the positron), and definitively showed that matter could in fact be created in the laboratory in a controlled experiment. With the development of super-high-acceleration machines after World War II, other particles (such as protons and neutrons) and their respective antiparticles were created, and even stored in magnetic “bottles”. However, when matter and antimatter meet, they completely annihilate each other in a brilliant flash of light produced by extremely high-energy gamma photons. This explosive annihilation mirrors the huge energy required to produce the matter-antimatter pairs in the first place. For example, the high-energy cosmic rays which regularly impact the Earth's atmosphere produce minute quantities of antimatter in the resulting particle jets, which are immediately annihilated by contact with nearby matter. The tiny quantities of antimatter which scientists have managed to create in the laboratory have always been accompanied by an equal quantity of normal matter, and the two tend to cancel each other out almost immediately. It is assumed that, very early in the life of the universe, in a process known as baryogenesis, massive numbers of particles and antiparticles were created and did in fact annihilate each other. The cosmic microwave background radiation which pervades the universe today represents the remains of the energy produced by this wholesale annihilation of the matched particle-antiparticle pairs. But a small imbalance remained, in the form of an excess of matter, of the order of one extra matter particle per billion matter-antimatter particle pairs. It has been calculated that this apparently tiny imbalance in the early universe would be sufficient to make up the amount of matter presently observable in the universe. In 1966, the Russian physicist Andrei Sakharov outlined three conditions necessary for a matter-antimatter imbalance to be possible: first, protons must decay, but so slowly that for all the protons in the Earth, fewer than a bread crumb's worth should have decayed so far; second, there must be specific constraints on the way in which the universe has cooled after the Big Bang; and third, there must be a measurable difference between matter and antimatter. James Cronin and Val Fitch won the Nobel Prize in the 1960s for their work on a particle called the kaon, which showed that particles and their antiparticles might not in fact be exact opposites, and it does seem possible that kaons might actually live longer than antikaons, but it is still far from clear whether this could account for the triumph of matter over antimatter in the universe.